Perhaps if Gulliver had met a Gypsy musician in the course of his travels and had been lucky enough to hear her in a spontaneous duet with a flute-playing giant, there might be some precedent for the music on this disc. As it is, we can be sure that will never have heard anything much like this before. The musical conversation is animated, alien, and timeless. 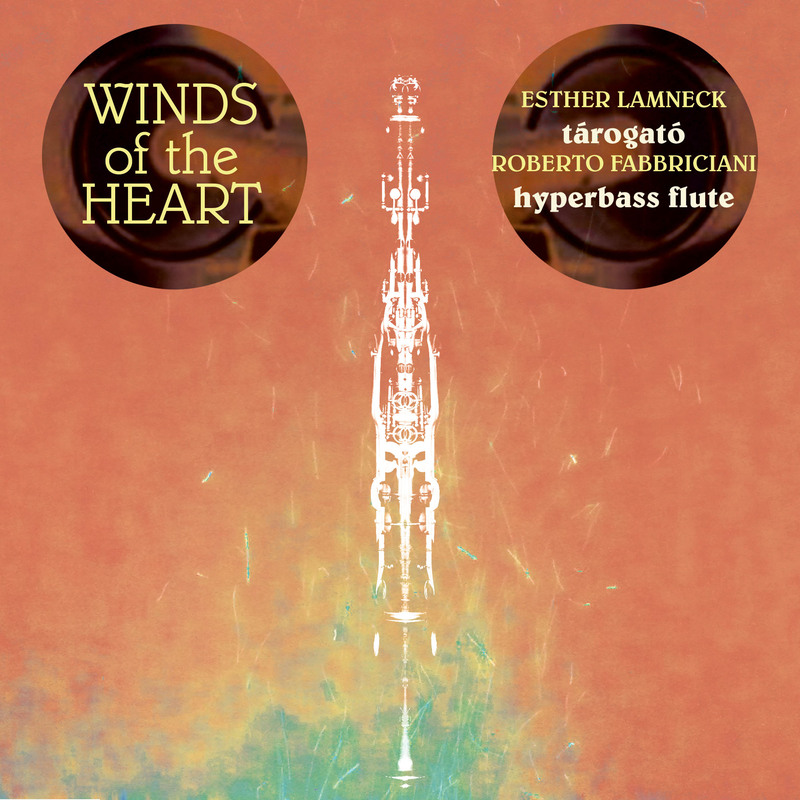 Wind superstars, Roberto Fabbriciani, flutist, and Esther Lamneck, clarinetist, came together in the summer of 2008 to explore the sonic possibilities of the HyperBass Flute (a plumber’s demented fantasy) and the Tárogató (a Hungarian reed instrument). It is easy to fall in love with these bizarrely lovely instruments, their emotional colors, and expressive resonance. The exploration of extreme low sounds has always intrigued Mr. Fabbriciani (the world authority on extended flute techniques and collaborator with the likes of Stockhausen, Ligeti, and Messiaen). With this instrument he has discovered not only a new sonic universe for the flute but new ways of sound production. The rich and colorful dynamic range of the instrument is enormous and allows him to move fluidly from softest breath sounds to the loudest of percussive effects. From multiphonics to vocal polyphony, the expressive possibilities for this instrument are extraordinary. The Hungarian Tarogato, a distant cousin of the clarinet, has one of the most beautiful sounds of any woodwind instrument. Ms. Lamneck, artistic director of the NYU New Music and Dance Ensemble, knows her way around it, cajoling arpeggios, slides, and circular breathing techniques out of it to leave you breathless. This fascinating CD was recorded in Arezzo, Italy in 2008 and released last year on Innova. It features New York-based clarinetist Esther Lamneck and Italian flutist Roberto Fabbriciani, both master performers who are playing more exotic instruments here. Lamneck is performing on the tárogató, a haunting, rustic Hungarian instrument, that is similar in timbre to an oboe or soprano sax. Fabbriciani is performing on the hyperbass flute, an instrument he first conceived in 1976 and had built in Germany in 2001. The hyperbass has no keys, but rather a series of registers with which a performer can play pitches from the harmonic series. The lowest note is C0, four octaves below middle C.
This CD contains a series of untitled improvisations, which flow very well together. Although the recording quality is a bit distant and muddy, the improvisations are consistently compelling as both players explore their instruments. The range of different timbres available on the hyperbass flute is particularly impressive. The mix of styles, textures, and interplay helps the recording maintain momentum throughout. A few tracks (1 and 4 in particular) treat the instruments more “traditionally,” with the flute keeping a drone and the tárogató playing a modal melody. Other tracks are more rhythmic and percussive (tracks 2, 7, and 14), with Fabbriciani “beat-boxing” at some points. Lamneck has plenty of moments to shine with her virtuosic whirling-dervish melodies as well as some slower, almost bluesy wails. Some tracks (especially 5) feature frenzied and dissonant workouts. Overall, the improvisations selected demonstrate a great balance of materials and influences; they are sequenced very well compositionally to make an exciting and eclectic journey. Omnivorous listeners, particularly fans of free improvisation, will enjoy this record very much. Highly recommended.